Description: Those fairies who become infused with the primal power of winter's chill, those who become infected with the nature of the evil dimension of Risia, become "Winter Fey", and they gain the power to freeze their victims with a mere touch. It's said that this wintery power freezes the heart of any normally good fey, corrupting the creature's nature and infusing it with hatred & spite. While a winter fey is visually recognizable as being a variant of its normal counterpart, its personality is decidedly altered. Whereas most fey are merely capricious and whimsical, winter fey take pleasure in causing pain and suffering. 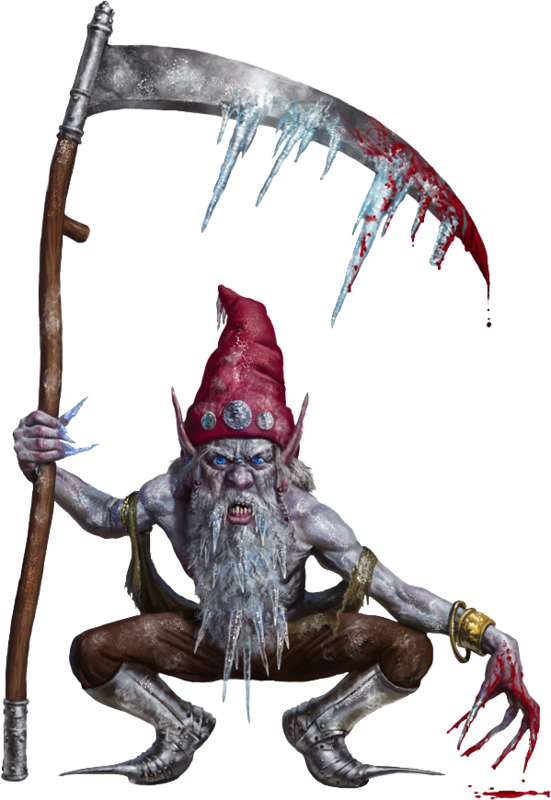 A winter fey is the same size as its normal counterparts, but it typically weighs a bit more because of the ice crusting its body. Information: Found mainly as natives of Risia as well as the reaches of the far north of Eberron, though some have migrated back into the frigid regions of Thelanis. Winter fey live in places far too cold for most humanoids to survive without magical assistance. The harsh landscape & bone-chilling climate match the hearts of these bitter creatures. A winter fey found far from cold lands is typically acting on the orders of a liege or in pursuit of an especially wily victim, as few choose to wander so close to the "hot lands" without a particular purpose in mind. However, winter fey have been known to travel deep into warmer climates in order to play a worthy enough trick on a creature. Winter fey live in the cold northern realms, staying far away from the heat of summer. When winter strikes, these malevolent creatures sometimes migrate south with the snowstorms, then return to the north as quickly as they came, at the first sign of the spring thaw. Some are known to move south every winter in search of new creatures to steal from, torment, or maim. As cruel as a winter storm, a winter fey feels no remorse for those it hurts. For its own amusement, a winter fey leads its victims far from civilization without any means to protect themselves from the elements and then abandon them, typically leaving them to freeze to death. Such a fey creature targets the innocent and gullible simply for sinister laughs, spending months crafting an exceptional ruse and then watching it play out. Savoring such delicious cruelty is what winter fey live for.